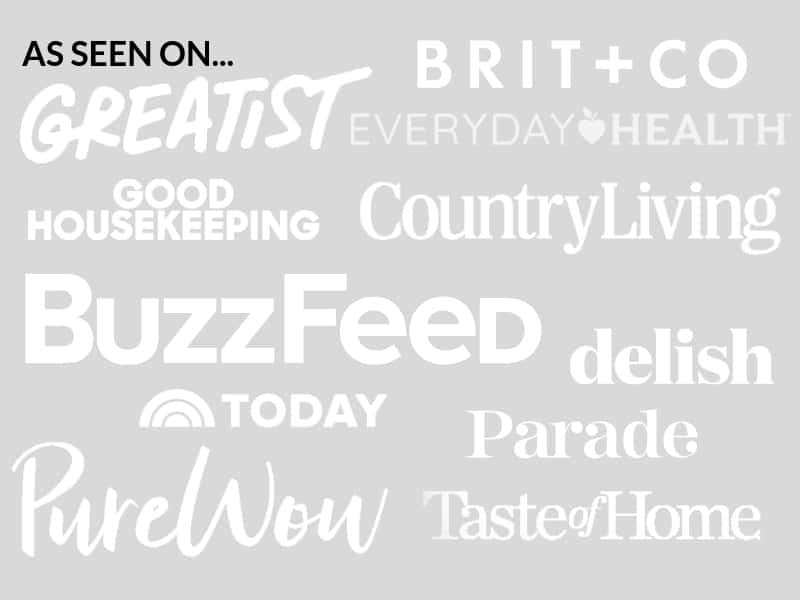 October 11, 2017 By Elizabeth Lindemann 4 Comments / This post may contain affiliate links. 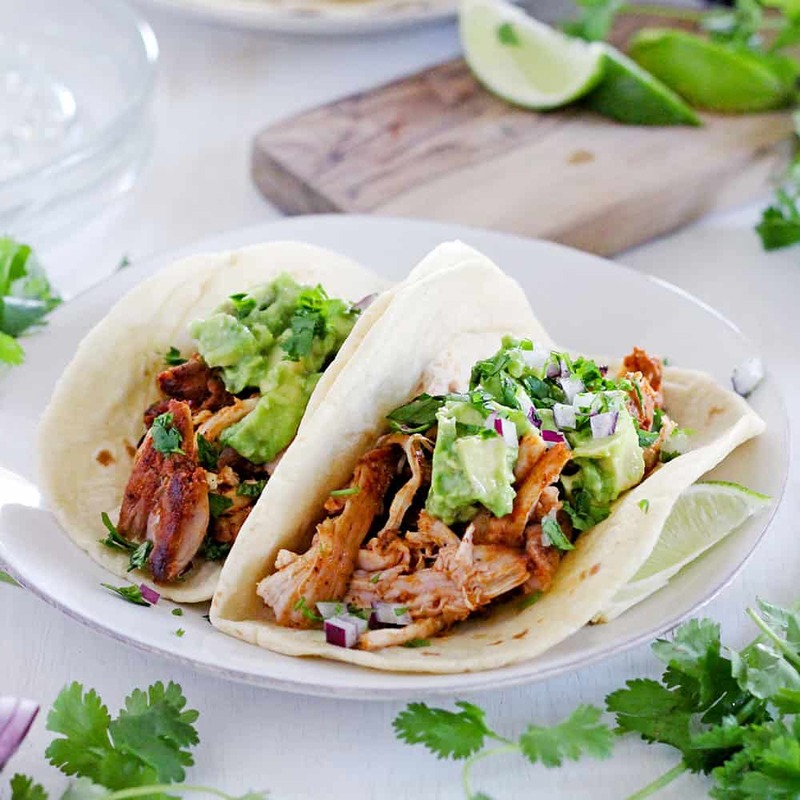 These Smoky Chicken and Avocado Tacos come together in only 20 minutes! They are simple, cheap, and oh so delicious. 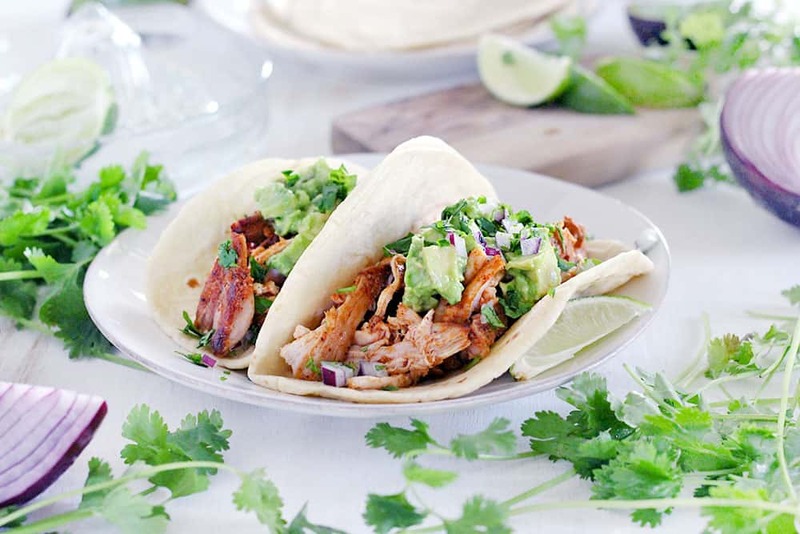 The chicken is perfectly seared and crispy on the outside and seasoned with smoky, savory spices, which pair perfectly with the bright lime juice mixed with the avocado. This is my new favorite quick and easy weeknight meal! 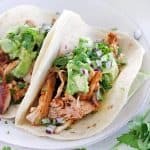 The chicken is a simplified version of one of my favorite recipes: smoky Mexican pulled chicken. It gets the bulk of its flavor from smoked paprika, one of my all time favorite spices. It adds the teeniest amount of heat and, as you may have guessed, a lot of smokiness. It’s a great, inexpensive, and natural way to get a deep smoky flavor if you’re in a hurry, can’t grill, and don’t want to use something like liquid smoke. I used chicken thighs because they’re cheap. And delicious. And nigh impossible to overcook. I actually prefer chicken thighs to breasts in almost any recipe for these reasons. They have a higher fat content, which helps keep them juicy and delicious, so if you want a leaner version feel free to use breast meat instead (it will still be awesome!). While this recipe does only take 20 minutes to throw together, it requires just a little bit of planning with marinating the chicken ahead of time. I prefer marinating meat overnight, but you can get away with 30 minutes if you need these tacos NOW. The chicken marinates in a little bit of lime juice, which helps break down the outer layer of the meat, penetrating the flavors even more and keeping it super juicy. I mixed the avocado with a little bit of fresh lime juice and kosher salt, like a very simple guacamole, to top the chicken on the tacos. I loveeeeee avocado- it’s one of my favorite foods of all time- but only so far as it mixes with other flavors. I actually don’t like plain avocado. In my opinion, it always needs at least a little bit of salt to bring out its full potential. Speaking of avocado… I am sad to report that it seems Zoey doesn’t like it. Not even with lime juice and salt added. Not even in guacamole form. She’s only 9 months, things could change, so I’m holding out hope. Her father and I already had a discussion with her about how no one in our family is allowed to dislike avocado but it’s like she didn’t listen or something! For a gluten free version of this recipe, be sure to use corn tortillas. These are smaller, so you’ll be able to stretch it to about 12 total tacos, whereas if you use flour it will be more like 8. Use lettuce wraps, serve over cauliflower rice, or toss in a salad for a low-carb, paleo version. 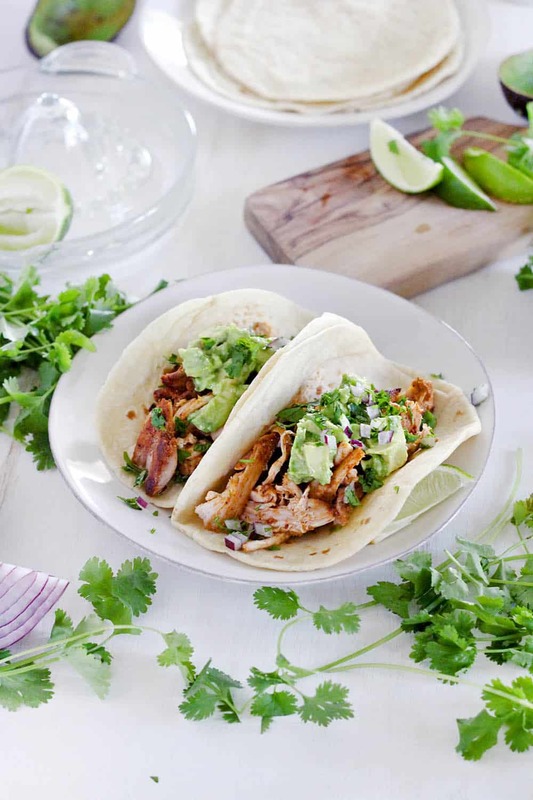 Here’s the printable recipe for these super quick and easy smoky chicken and avocado tacos! 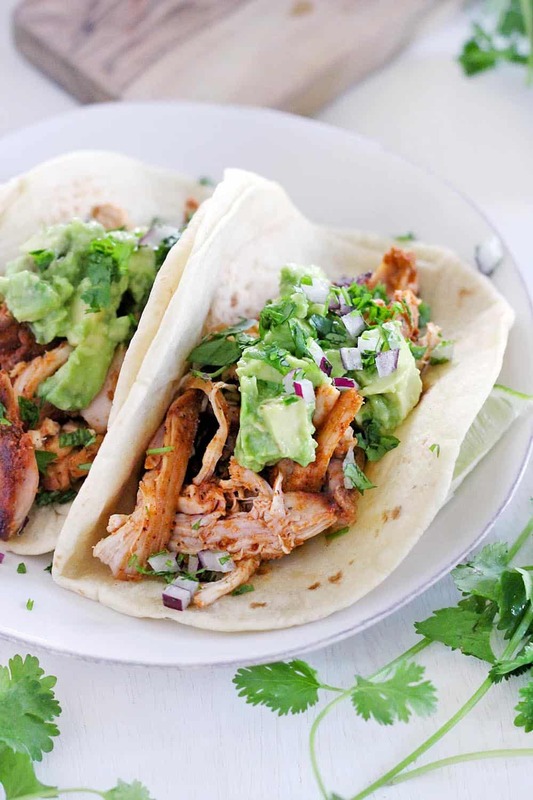 These smoky chicken and avocado tacos come together in only 20 minutes! They'll be your new favorite easy weeknight recipe for taco night and the whole family will love them. optional toppings: chopped fresh onion and cilantro lime wedges, sour cream, salsa, hot sauce, etc. Mix the chicken, smoked paprika, cumin, garlic powder, 1 tablespoon oil, 1/2 the lime juice, and salt to taste in a bowl or zip-top bag. Allow to marinate for at least thirty minutes, preferably overnight. Heat a heavy skillet over medium-high heat and add the remaining 1 tablespoon oil. Cook the chicken for 4-5 minutes on each side, trying not to move it as much as possible, until fully cooked and seared/browned on the outside. Meanwhile, mix together the diced avocado, remaining 1/2 of the lime juice, and salt to taste in a small bowl. Wrap the tortillas in a damp towel and place in a tortilla warmer or plate, microwave for 15-20 seconds to warm. When chicken is cooked, transfer to a cutting board and allow to rest for 5-10 minutes. Shred with two forks. Top each tortilla with some chicken and avocado mixture, as well as any optional toppings you want. For a gluten free version of this recipe, be sure to use corn tortillas. These are smaller, so you'll be able to stretch it to about 12 total tacos, whereas if you use flour it will be more like 8. Use lettuce wraps, serve over cauliflower rice, or toss in a salad for a low-carb, paleo version. You were correct, easy and delicious! When I see an easy recipe with all my favorite ingredients I know it is must try. This recipe is a keeper!